This simply delicious recipe of Aata/ whole wheat flour Laddoos /Pinnies is contributed by Mrs. Usha Mehta. Hi friends! A ladoo made of whole wheat flour is a winter treat.There are so many regional variations. 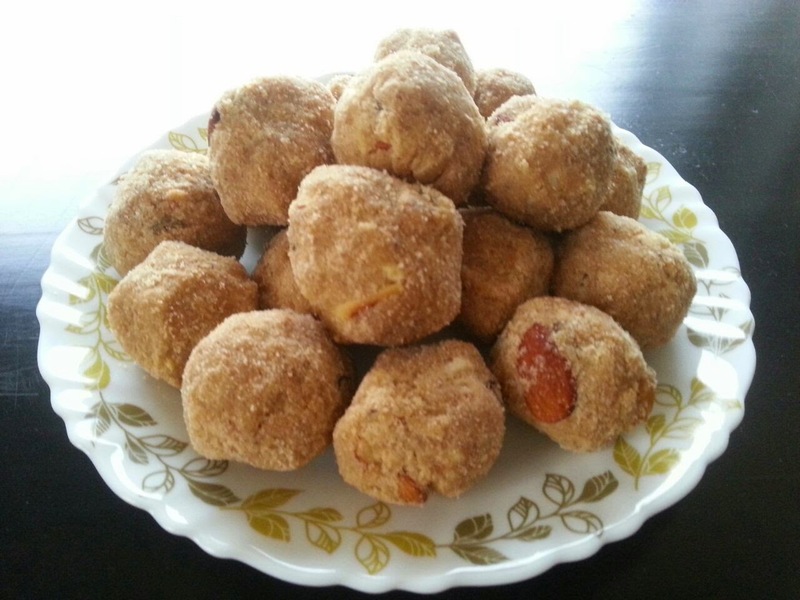 Wheat flour laddoos, are a rich, sweet dessert or snack. It is a simple recipe with few ingredients, but the taste is amazing! Heat the ghee in a big wok/kadahi/thick-bottomed pan. Add gently the aata/whole wheat flour to it. Stirring continuously, on medium flame, mix well and fry the aata/ whole wheat flour till good fragrance emits and color of the flour is slightly changed to a light golden. When aata/ whole wheat flour is well fried, take it off the heat, add the dry fruit and mix well, gradually add powdered sugar, mixing constantly. Mix very well, cool the mixture to a bearable/ handle able level and bind it into small round shapes, the pinnis! Cool the pinnis before storing in a container.Makes 36 medium sized pinnis. Note: Slivered almonds from are shaved California almonds perfect for baking or making cookies. Why whole wheat is good for you? Whole grains are packed with nutrients, including protein, fiber, B vitamins, antioxidants, and trace minerals (iron, zinc, copper, and magnesium). A diet rich inwhole grains has been shown to reduce the risk of heart disease, type 2 diabetes, obesity, and some forms of cancer.